While taking care of his mother with Alzheimer’s, Ken Routson from Dayton, Ohio noticed in her characteristics and behaviors similar to people with autism. Ken was very familiar with autism, as he has worked in the field of disabilities for over 35 years. 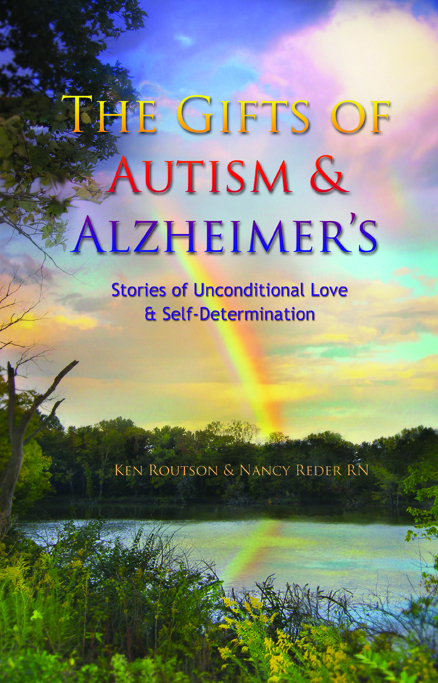 Ken asked Nancy Reder, a retired registered nurse also from Dayton, to co-author the book, The Gifts of Autism and Alzheimer’s, a compilation of insights, observations, and inspiring personal stories by and about individuals with autism and Alzheimer’s. This book is a spectacular marriage of psychology and physiology—of attitude/emotion and biology. It is filled with critically important perspectives to adopt, practical advice on putting those beliefs into action, and remarkable examples! In Fact, one of the most moving and indispensable aspects of this book is the beautiful collection of chapters written first-person by the touching and astute contributors. You will get so much from these people! When you finish The Gifts of Autism and Alzheimer’s—the title which might seem preposterous to some will be fact for you. Of course, no one sits around wishing for their child to have autism or their parent or partner to have Alzheimer’s, and this book certainly doesn’t ask you to do such a thing. But once someone you love already has either of these diagnoses, this book will open your eyes to see the gifts and the possibilities within that person’s challenges—and, in so doing, to be maximally helpful to that person. I have had the opportunity to review a most interesting book on the life’s journey in caring for someone with Alzheimer’s. I found it interesting and touching at the same time. The authors combined their professional experiences with autism with their personal experiences in caring for a parent with Alzheimer’s. They noted the similarities between the two disabling conditions. I loved the personal comments, as they made the reading both interesting and well worth the time. I wish that this book had been available when I was first learning that my daughter had a disability. Dr. Robert Melillo, an internationally known lecturer, author, educator, researcher, and clinician in the areas of neurology, rehabilitation, neuropsychology, and neurobehavioral disorders in children says in his book, Autism: Where there is chronic stress, there is usually inflammation, and where there are both, there most likely is a brain imbalance. Inflammatory chronic illness and autoimmune disperse desires are part and parcel of an immune system out of balance. Research shows the ramifications of inflammation with Alzheimer’s and the abnormal levels of the stress hormone cortisol that are present in children with autism and persons with Alzheimer’s. Finally this thought and feeling provoking book conveys hope for prevention and perhaps future cures with the new progressive science of neuroplasticity and epigenetics. Once you read this book, you will never be able to unread it—and trust me, that’s a good thing…because it means that you will never be able to see only one side of autism, Alzheimer’s, and many other seemingly tragic diagnoses and conditions. You will no longer be able to sustain the idea that these challenges can only be seen as unmitigated hardships and unsolvable conundrums. You’ll have a difficult time maintaining the feelings of hopelessness so deeply embedded in our culture. You won’t view fear or sadness as the only human response to having a loved one diagnosed with autism or Alzheimer’s, and it will no longer be possible for you to be able to look at someone you care about with neurological challenges and simultaneously think to yourself, “there’s nothing I can do to meaningfully impact my loved one’s condition.